Congratulations to Julie, LibraryPat, and Taurus, the winners in Rory's giveaway. Thank you to all who participated! I am honored to be featured today on the JustRomanticSuspense.com website. I have been a fan of the site for years and I am thankful that Maureen has given us, in the genre, this forum to reach new readers. Honestly, as and author I did everything wrong. As an avid reader of multiple genres including non-fiction I certainly admired the authors for their drive and determination to push through a great product to completion and publication. Largely untrained in the writing profession and especially fiction, I just sort of jumped in. It was fun and I do not regret doing it that way, because . . . I still find it fun. I did have to back track and learn the art of writing and with the help of my brother, Mark Manley a published author, and ultimately the organization of Romance Writers of America, I was after many years able to attain my goal. Certainly, I would advocate, for most, the formal approach of taking creative writing courses and beginning with short stories or just scene writing. In that way the craft can be honed efficiently and wasted time and effort minimized. That having been said, I have tended to learn by the school of hard knocks and I guess I did writing the same way. You know though, often times in life, the destination is secondary to the journey and I think this has been true for me in my writing career. It took nearly twenty years for my first book, novella HOME BY CHRISTMAS, to be published by a wonderful Publisher, Kerry McQuisten, at Black Lyon Publishing in 2013. That was followed by HOLD ME AGAIN in 2015 and now KINDRED SPIRITS the HEALERS. I had written four books before the first was published and now number five and three are also published. I took me numerous rewrites on all but especially number three to get them up to the quality that deserved publication. My first book will never again see the light of day – horrible – but a good learning experience. For Indie writers I would encourage all to make SURE you have learned the craft of writing well and have edited and rewritten you manuscript extensively before self-publishing. Don’t get me wrong, today 2017, there are some great Indie writers out there. But I will tell you that you only get one chance at a first impression – and most readers will not give you a second chance if you fail to capture them in the first few pages of your first novel. It has been very nice to talk with you today and I hope to hear from you through social media. Crystal Blackrock is a member of the Creek Nation, blessed with wisdom and talents passed down from her healer grandfather. Dr. Gant Sands returned from a military deployment in Afghanistan to immerse himself in a healing career of his own. An avid artifact collector, his own interests and bloodline have been secondary – until now. 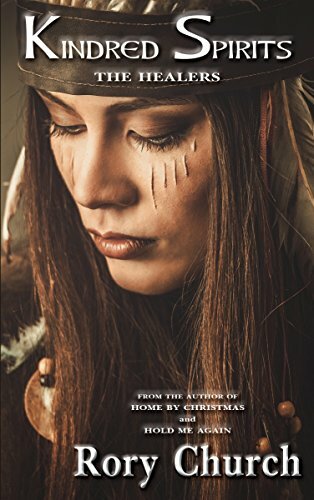 When a series of murders tainting the spirit of the sacred tribal land throws Crystal and Grant together on a journey, they’re not only meant to help solve the crimes, but the mysteries of a love that seems predestined. Rory Church is a writer of romance and suspense fiction. He is a long-time Gulf Coast resident and member of Romance Writers of America. Rory is a Naval Academy graduate and military veteran. He lives and travels with his wife and high school sweetheart, who is the romantic soul and critical center of his writing. He continues to write overlooking the emerald waters of the Gulf of Mexico or while pondering the stream outside his cabin in the western North Carolina mountains. He says, "Inspiration comes from many corners and the trail of life often leads to curves and drop-offs never expected. But it yields the pebbles and roots of which great stories are made." Rory will be giving away three print editions of KINDRED SPIRITS the HEALERS to three lucky readers leaving a comment or email entry. Giveaway ends 11:59pm EST Feb. 12th. Please supply your email in the post. You may use spaces or full text for security. (ex. jsmith at gmail dot com) If you do not wish to supply your email, or have trouble posting, please email maureen@justromanticsuspense.com with a subject title of JRS GIVEAWAY to be entered in the current giveaway. US residents only. Great giveaway <3 Thanks for the opprotunity. Cover is eye catching and I enjoyed the book blurb - added to my TBR list. Rory, nice to meet you. This is my first visit to JustRomanticSuspense.com and I found your post inspiring. Thanks for sharing and thanks for serving our country. I'd love to win a copy of your book, and I hope you find much success in your writing! Good for you in persevering and getting your books written and published. Many of us have that dream but do not hang onto it and work at it long enough to make it come true.